Music in Bamboo and Bone Performance Piece, "Mona Lisa, Buddha and Me"
Bamboo and Bone concerts transform the human experience into music. The concerts take many forms. Solo Performances by Allen Nyoshin Steir elevate audiences with the sacredness of the Japanese bamboo flute, the shakuhachi. Together with Mallie Boman, the music and musings form an electric and eclectic experience that is provocative, refreshing and transcendent. Bamboo and Bone concerts may include guest artists. 60 minutes of pure Honkyoku - the original Zen meditation music - gathered from temples throughout Japan and passed down from teacher to teacher since before the 13th Century to the present. Hear the tradition. 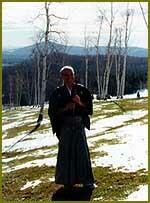 . .
Selections are from the repertoire of the Fuke sect of Zen and comprise Sui-Zen (Blowing meditation). 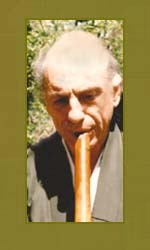 Shakuhachi ShiHan Master Allen Nyoshin Steir plays with heart and soul, a sensation reflected in his given Japanese name.